This listing is for 20 bottles of Super Green. This advanced Lucky Bamboo liquid fertilizer has improved formula compare to regular Green Green on the market. The Lucky Bamboo farms in China are actually using this Super Green in a more concentrated formula as industrial bamboo growing fertilizer. Compare to the regular Green Green made in Korea, This Super Green works much better for your plans. I personally tested it on my Lucky Bamboo and regular plants in soil. Leaves grow almost 3 more inches in 2 weeks, and plants are all look much healthier. I was so surprised about the amazing result. Directions: According to my personal experience, use half amount of Super Green as directed on the box works just fine. My suggestion is just add 5 drops of liquid in your small lucky bamboo arrangement directly into the water every week. For larger Lucky Bamboo, double the amount of Super Green, and so on. Or you can add the Super Green in the water, and fertilize the soil of other plants in your house. That's it! 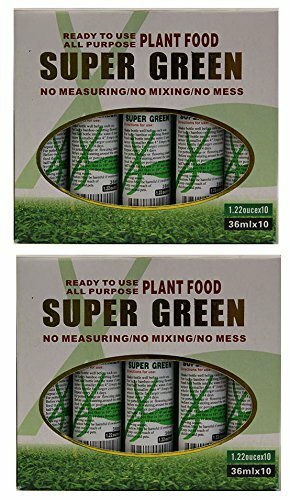 20 bottles of Super Green - Lucky Bamboo liquid fertilizer works like a magic. Also it can be used on all other plant, in water or soil. If you have any questions about this product by KL Design & Import, contact us by completing and submitting the form below. If you are looking for a specif part number, please include it with your message.